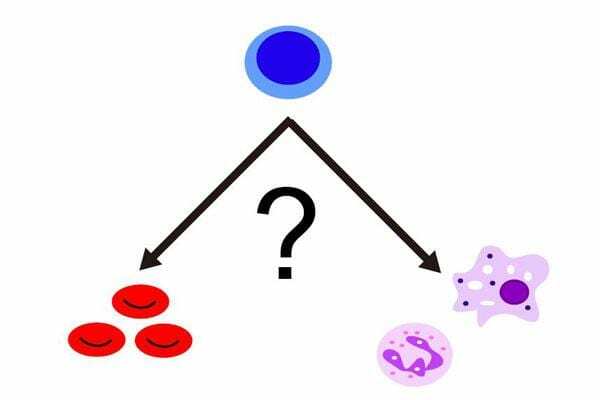 Japanese scientists have revealed a biological "switch" that influences whether an immature blood cell would develop into a red blood cell or a subtype of white blood cell called myeloid cells in response to infection or inflammation within the body. Their findings were published on September 24 in Nature Immunology. The mechanism which causes immature blood cells to differentiate into red or white blood cells in response to environmental triggers has remained elusive, and a clearer understanding could offer therapeutic targets for treating bone marrow and blood disorders such as anemia induced by infection, inflammation and blood cancers. Immature blood cells can differentiate into either red or different types of white blood cells depending on environmental triggers. Infection, for example, could trigger the formation of white blood cells whose primary role is to fight disease; but this would result in fewer red blood cells being formed, which can lead to anemia of infection/inflammation. Furthermore, by producing more white blood cells, the body is able to eliminate pathogens that cause infection, while suppressing red blood cell production restricts the availability of iron needed by pathogens for growth, thus preventing them from multiplying. Reducing the number of red blood cells may also prevent them from being targeted by pathogens such as malaria. However, since red blood cells are responsible for transporting oxygen around the body, any form of anemia could reduce the amount of oxygen being carried to other parts of the body, resulting in symptoms that include shortness of breath, fatigue, lightheadedness and weakness. These symptoms are also associated with myelodysplastic syndrome, a disorder caused by a malfunction in the bone marrow–the factory where all blood cells are formed–that results in not enough healthy blood cells being produced. Using a genetic technique known as double knock-out (DKO), which represses two genes, rendering them non-functional, the scientists targeted Bach1 and Bach2 transcription factor proteins in mice. Transcription factors are proteins that control gene expression in cells by turning genes on or off according to certain stimuli. They found that red blood cell production was ineffective in the DKO mice, leading them to conclude that infection stimulates a reduced expression of Bach factors, which may contribute to the development of anemia of infection/inflammation. According to lead author Hiroki Kato, a researcher in the Department of Biochemistry and the Department of Hematology and Rheumatology at Tohoku University Graduate School of Medicine in Sendai, Japan, transcription factors Bach1 and Bach2 support the formation of red blood cells by repressing white blood cell formation at the normal (healthy) state. Repressing Bach1 and Bach2 in the DKO mice induced the formation of white myeloid blood cells at the expense of producing red blood cells and another type of white blood cells called lymphoid cells. "Our observations suggest that repression of Bach factors contributes to the development of anemia of infection/inflammation and featured symptoms of myelodysplastic syndrome," said Kato, adding that "Bach factors could therefore be a new therapeutic target of refractory anemia," where normal blood cell production in the bone marrow is disrupted as a result of these diseases. The results of this study and previous research show that Bach factors play multiple roles in the formation of blood, such as supporting the formation of red blood cells and lymphoid cells from immature blood cells and the development and response of immune cells at mature cell levels, said Kato. "These facts suggest that Bach factors work as a 'switch' controlling the steady state as well as the emergency state of blood cell formation," Kato explained. "We would like to reveal the fundamental mechanism of the switching system between steady state and emergency state by studying the roles of Bach factors as a guide." According to co-author Kazuhiko Igarashi, a scientist in the Department of Biochemistry and the Center for Regulatory Epigenome and Diseases at Tohoku University, the principle of blood cell formation: to be or not to be white myeloid cells, is regulated by a network of transcription factors–proteins that control the rate of transcription of genetic information from DNA to messenger RNA by binding to a specific DNA sequence. "Cells appear to stabilize their state of gene expression and thus identities by non-genetic modifications of chromatin," said Igarashi. Understanding how the network of transcription factors deploy non-genetic regulators at their target genes is important for understanding the underlying causes and symptoms of disease. "Ultimately, we need to understand dynamic behaviors of these regulators caused by signaling cascades and intrinsic fluctuations at a single cell level," said Igarashi. "Such studies will lead to understanding of cell fate decision and disease pathology."